I was struggling a little about what to write about next. Sometimes there is just so many topics to chose from and when to write about them that it sort of stumped me. But strolling through Facebook this morning, I saw a story posted by Rehab Minder about arm wrestling on ABC news in Australia. How easy it is to break an arm? This is a simple reminder about playful arm wrestling, or even finger wrestling. This guy in Australia broke his arm on national television while arm wrestling on a show. OUCH?? How crazy is that?? I had a patient, a guy, arm wrestling with a friend. In a split second, his friend wanted to win and stood up just a little which was enough to place a certain about of torque and force of the arm, cracked it right in the middle of the long arm bone (the humerus) and there was a very loud “crack” and then his arm was bent in a position that it’s not supposed to. The scar goes from the back of the arm from the arm pit down almost to the elbow. He was very lucky though in the sense that he did not injure the radial nerve that passes a little higher then where he broke it. His occupational therapy with me was not too intensive believe it or not because it was between the shoulder and the elbow. So he was able to start moving right away, even with the staples. He was also able to follow up with a lot of the exercises I gave him on his own. My other guy (yes another guy) broke his index (pointer) finger playing finger wrestling with a friend. College men, needing something to entertain themselves, decided to play who’s got the strongest will. I would say it was my patient, lets call him Ray. Ray held on now matter what because he said he didn’t feel pain, he only felt it when his finger cracked in a spiral pattern and his finger was dangling. Boy did his friend feel terrible! And the sound of breaking bone is actually kinda disgusting…. That’s a picture of his finger right after surgery. 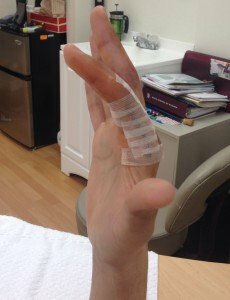 Fingers are actually much hard to rehab and can face a lot of issues of motion if not careful. Ray was able to start right away as well and with in a month was able to be functional again, especially with taking notes in class. Fingers are a lot more painful and get very stiff, very fast, and Ray had all the above. But with the right exercises, his ability to tolerate the pain, and his great follow up in therapy and home program, he did great!! I wish I had taken a picture of his after. We can all get hurt from just about anything BUT this is just a friendly reminder that playful wresting can hurt….watch here on youtube the video of arm wrestling gone wrong.